The Shanghai Composite Index finished the week strongly, up 35.32 points, or 1.68%, at 2,135.83. Over the week, eight stocks rose, two were static and ten fell. Ping An Insurance come out the winner, rising 5.3% over the week, while Noble Group showed the largest fall, down 2.8%. Sinopec and China Telecom were flat. The major stocks rebounded somewhat today after yesterday’s drubbing. Eleven finished up at closing, with SAIC Motor leading the pack (up 3.98%). Only Jardine Matheson (up 1.36%) also managed to rise by over 1%. Seven stocks fell, with two banks (ICBC and Bank of Communications) amongst on news that non-performing loans were up in Q3. China Construction Bank and Agricultural Bank reported lower non-performing loans in Q3, and rose by 0.47% and 0.4% respectively. The Shanghai Composite Index finished at 2100.51, up by 12.57 points or 0.6%. China’s stocks delivered a resounding “Not impressed” to the results of the Third Plenum, with every single major stock falling. This should not be much of a surprise, despite the sentence that markets will have a “decisive role”. Chinese political statements are not the grandiose decisive pronouncements that we in the west are familiar with. This is through a difference in governing and relations to media. In the west, governments have to talk big to lay down their markers and influence the debate; they have to raise their banners high so that they can be heard and understood over the media babble. China, with its control of media and the (official) political discourse, has no such problems here. It can talk small, even opaquely, but move on its own terms. Those expecting a “Big Bang” announcement of deregulation and dismembering of the SEOs would do well to remember the Russian experience of the early 1990s (and that these disastrous policies were advocated by the World Bank and other “experts”), and the Chinese leadership is right to be wary of this. But small changes in official language (such as that regarding the market) can have enormous consequences. The market may signal short-term disappointment at the lack of dazzling policy announcements, but the Third Plenum may yet herald significant moves. On the day, Bank of Communications (down 3.12%), SAIC Motor (down 2.98%) and Ping An Insurance (down 2.94%) were the biggest fallers. Jardine Matheson was relatively unscathed, down 0.25%. The Shanghai Composite Index was down 38.83, or 1.83%. By 9:19 pm, the value of transactions on Tmall and Taobao surpassed 30 billion yuan, up nearly 60 percent on sales for the event last year, as Ma had predicted. The projected increase is driven in part by China’s growing number of mobile Internet users, which research firm Analysys International has forecast will exceed 700 million this year. China’s top four banks posted their biggest increase in soured loans since at least 2010 as a five-year credit spree left companies with excess manufacturing capacity and slower profit growth amid a cooling economy. Bad debts at Industrial & Commercial Bank of China Ltd., China Construction Bank Corp., Agricultural Bank of China Ltd. and Bank of China Ltd. rose 3.5 percent in the third quarter to a combined 329.4 billion yuan, data compiled from earnings reports showed. China is stepping up what is already one of the most ambitious urban rail projects in history despite concerns that the country’s obsession with infrastructure could be dragging it into a pit of unmanageable debt. The aim of the expansion isn’t stimulus but urbanization. According to the China Daily, private partners will be allowed to take 10 to 15 percent stakes in the country’s state-owned enterprises (SOEs). The move would give such companies or investors a bigger say in decision-making, it quoted officials of the state-owned Assets Supervision and Administration Commission (SASAC) as saying. The agency is a powerful body that oversees large SOEs collectively worth trillions of dollars, many of which enjoy monopolies in key sectors such as rail and energy. China’s economy entered the final quarter of 2013 with an acceleration in manufacturing and exports, momentum that offered confidence to Communist leaders gathering to determine policy shifts for the coming decade. Industrial output rose a more-than-estimated 10.3 percent from a year earlier in October and manufacturing investment strengthened, according to data released Nov. 9 by the National Bureau of Statistics. Customs data the previous day showed overseas sales rebounded by more than forecast. When a Chinese engineering firm sets off to build a road or a dam in a distant country, a Chinese bank is usually not far behind them. Bank branches bearing Chinese characters can be found on the streets of Lima and Warsaw, as well as Paris and New York. A deal at the end of October in which China Construction Bank (CCB) acquired a lender in Brazil underscores the size of the banks’ ambitions. The second-largest Chinese bank by assets agreed to pay 1.62 billion reais (US$716 million) for 72% of Banco Industrial e Comercial. Let’s take four of the STI’s components, Jardine Matheson Holdings (SGX: J36), Jardine Strategic Holdings, Jardine Cycle & Carriage and Hongkong Land Holdings, as an example. An investor who had invested in these four companies might think he’s diversified, but he’s not: all four companies have inextricable links with each other. JMH owns more than 80% of JSH, which in turn owns half of Hongkong Land and almost three-quarters of Jardine C&C. And to top it off, JSH also owns slightly more than half of JMH. This creates a complex web of ownership-links between these few companies and unites them in the realm of risk-exposures. An untoward development in properties that Hongkong Land Holdings owns, for instance, might turn out to be a kick in the gut for JMH and JSH as well. (Reuters) – Singapore state investor Temasek Holdings TEM.UL and China-focused private equity firm Hopu were among five investors buying a $213 million stake in Yashili International Holdings Ltd (1230.HK), after parent China Mengniu Dairy Co Ltd (2319.HK) sold down shares to meet Hong Kong listing requirements. Temasek, through one of its Mauritius subsidiaries, Hopu and three individual investors agreed to buy 471.13 million shares of Yashili from Mengniu for HK$3.50 each, putting the total deal at HK$1.65 billion ($213 million), the dairy companies said in a securities filing on Monday. Industrial & Commercial Bank of China Ltd. was added to a list of too-big-to-fail banks that must set aside additional capital to guard against losses as part a global regulator’s plans to protect the economy. ICBC was the only firm joining the Financial Stability Board’s annual list of too-big-to-fail banks, which it produces in preparation for capital rules scheduled to be phased in starting in 2016. Other changes include lower surcharges for Deutsche Bank AG (DBK), and Citigroup Inc. (C), which both drop out of the top category and Bank of New York Mellon Corp.
LONDON (ShareCast) – BG Group has sold its stake in the Queensland Curtis LNG (QCLNG) project in Australia for 1.93bn dollars to China National Offshore Oil Corporation.CNOOC has also reimbursed BG for project expenditure in line with its increased interests incurred from January 1st 2012 to September 30th 2013. Carlsberg A/S’s pursuit of faster growth in Asia may make takeover targets out of Tsingtao Brewery Co. and Beijing Yanjing Brewery Co. The Danish brewer’s controlling shareholder signaled last month that it will give Carlsberg more leeway to pursue deals. The $15 billion company is eyeing about a half-dozen potential candidates, especially in Asia, including Tsingtao and Yanjing, for a possible purchase, said a person with knowledge of the matter, who declined to be identified as the discussions are private. The Chinese companies each produce some of the most popular beer brands in China, the world’s biggest beer market. Revenue from healthcare services increased 16% to $43.1 million from $37.3 million in the prior year period. Adjusted EBITDA was $5.0 million, compared to $6.0 million in the prior year period. Development, pre-opening and start-up expense was $4.9 million, compared to $2.7 million in the prior year period. Loss from operations was $2.8 million, compared to income from operations of $1.5 million in the prior year period. Net loss was $3.8 million, or $(0.23) per diluted share, compared to net loss of $664,000, or $(0.04) per diluted share, in the prior year period. Full year guidance adjustment primarily due to government regulatory delays. Total number of diesel engines sold rose 21.5% to 118,282 units compared with 97,328 units in the third quarter of 2012. China is on the cusp of its 4G rollout, but handset maker Huawei doesn’t want smartphone owners getting complacent. The company just announced it will invest $600 million into 5G research and development. Record-breaking milestones have become routine in the breathtaking development of high-speed railways in China, known as gaotie. In just five years, since the first one connected Beijing with the nearby port of Tianjin in 2008, high-speed track in service has reached 10,000 kilometres (6,200 miles), more than in all of Europe. The network has expanded to link more than 100 cities. In December the last section was opened on the world’s longest gaotie line, stretching 2,400km from Beijing to Shenzhen, on the border with Hong Kong (see map). The network has confounded some sceptics who believed there would not be enough demand. High-speed trains carry almost 2m people daily, which is about one-third of the total number of rail passengers. China’s exporters had a good month in October, with shipments up 5.6% from a year earlier, far better than the 1.5% growth forecast by economists. That was enough to more than double China’s monthly trade surplus to $31.1 billion, despite strong imports. Matched with decent performance from other East Asian exporters, that suggests that an upturn in demand from the U.S. and Europe is helping support the Chinese economy, which has had a wobbly year. But it may not be out of the woods yet. The Shanghai Composite Index fell 1.1 percent to 2,106.13 at the close, adding to a 2 percent loss this week. China’s exports rose 5.6 percent in October, compared with a median estimate for 1.7 percent growth in a Bloomberg News survey. The yuan was poised for a weekly advance as the central bank raised the reference rate on anticipation the Communist Party meeting will lead to further economic reforms. Blue chips like Jardine Matheson Holdings (SGX: J36), Singapore Exchange (SGX: S68), and United Overseas Bank (SGX: U11) have had average annualised returns (including dividends) of 23.5%, 20% and 8.8% respectively in the same period. Standard Bank said in July it was exploring closer cooperation with its biggest shareholder Industrial & Commercial Bank of China on its global markets and commodities businesses. Qunar, a travel search and service provider, went listed on the NYSE last week. Its shares soared 89% on the first day of trading. As Qunar became more than a search engine when it built a transaction system in 2012, it is believed it will eventually become direct competitors of existing online travel agencies such as Ctrip and eLong. With that concern, in early this year, a handful of online travel services, including Ctrip and eLong decided to stop working with Qunar. But later they resumed cooperation with Qunar. One the reasons is the traffic on the search service is too high to ignore. Now Qunar’s market cap is a little less than half of that of Ctrip who is still the largest player in online travel in China. When asked about the potential competition with Qunar on the earnings call for Q3 2013, James Liang, chairman and CEO of Ctrip, said it’s more of competition on air ticket but more of partnership on hotel, for Qunar’s hotel inventory mostly depends on third-party suppliers. But like what it has done on air ticket, Qunar also possibly can build partnership directly with hotels rather than travel agencies or other third parties. Mr. Liang thinks what can eventually differentiate Ctrip from Qunar is the quality of service — it sounds it doesn’t have any technological advantage. China looks set to snap up over 350 million new smartphones this year. So what brands are Chinese people buying? How much do they spend on 3G? Who are these people exactly? What OSes do they prefer? Alibaba’s foray into the world of fund management—through a money-market fund-like investment product called Yu’E Bao, or leftover treasure—has so far been a huge success. The lingering question, however, is how exactly it works. One of Yu’E Bao’s appeals is that it gives customers the convenience of a demand deposit—they can withdraw their funds whenever they like—with returns similar to wealth-management products or other longer-term deposit options like CDs, which typically lock the funds for three to six months. Yesterday’s gains instantly vanished, in what was probably a swift bout of profit-taking and awareness that the rises were not market-driven. Only one stock rose, SAIC Motor climbing 0.14%. 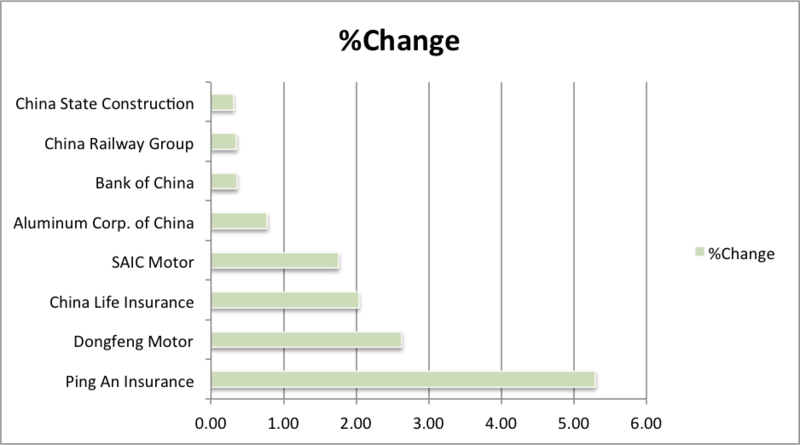 The largest fallers were New China Life Insurance (2%) and Aluminum Corp of China (1.99%). The four major banks were unscathed, with ICBC, China Construction Bank, Agricultural Bank, and Bank of China all flat on the day. On a poor week (where the Shanghai Composite Index fell 43.44 points, or 2.02%), only three stocks moved ahead, while a full fifteen fell. 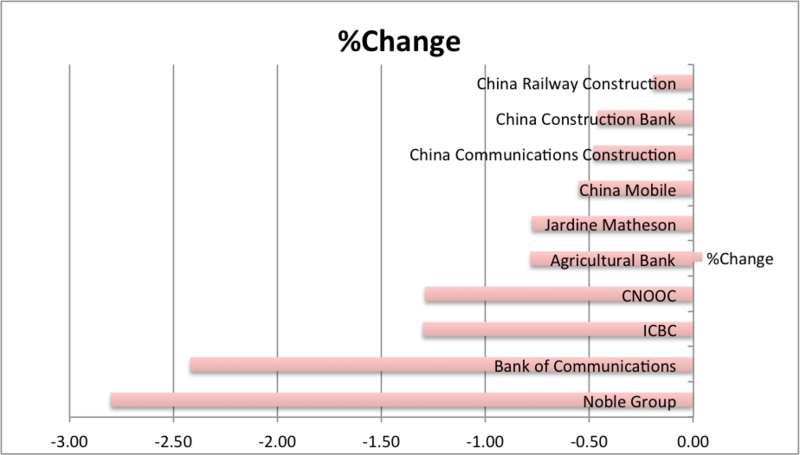 Sinopec rose by an impressive 5.75%, while Jardine Matheson (of Kong Kong) did worst, falling 3.94%. Conglomerate Jardine Cycle & Carriage (SGX: C07) announced third quarter earnings yesterday evening and turned in a performance that investors would likely want to forget. The company is more than 70% owned by Jardine Strategic Holdings (SGX: J37), which is in turn majority owned by Jardine Matheson Holdings (SGX: J36). Jardine C&C’s main business interest lies in its 50% ownership of Indonesia conglomerate Astra, with the latter accounting for more than 90% of the former’s sales and profits. Astra is involved with a wide range of businesses which includes automobile dealerships; manufacturing, assembling, and distribution of motor vehicles; financial services related to consumer loans for vehicles; insurance; banking; mining; oil palm plantations; information technology; infrastructure and logistics; and heavy equipment engineering, among others. During the three months ended 30 Sep 2013, the company brought in US$4.64b in revenue, representing a 13% decline compared to a year ago. Its profits suffered even more as it dropped 31% year-on-year to US$222m. In China, the Shanghai Composite was down 0.8 per cent even though oil major Sinopec’s state-owned parent said it would buy back up to $17.7bn of its shares in the next year as the government seeks to support the sagging local stock market. SoftBank Corp. (9984) said it plans to keep its stake in Alibaba Group Holding Ltd. if China’s largest e-commerce company proceeds with what may be the biggest initial public offering since Facebook Inc. The Tokyo-based wireless carrier holds about 37 percent of Alibaba, Yoshimitsu Goto, SoftBank’s general manager for finance, said in an interview. SoftBank hasn’t told Alibaba when to hold an IPO or where to hold it, Goto said. Alibaba-owned Chinese traffic stats company CNZZ‘s latest report shows a strong performance by Qihoo’s 360 search engine, which is now above the 20 percent market share benchmark. Qihoo (NYSE:QIHU) says it aims for 25 percent by the end of the year. In the past three years, China’s domestically traded Class-A share market rose in the 10 trading days before seven of the eight top-level economic-policy meetings, according to calculations by UBS AGUBSN.VX +1.87%, with gains of as much as 5.2%. The benchmark Shanghai Composite Index has delivered an average gain of 1.1% in the 10 days leading up to such meetings since 2010. The index has risen 1.1% since the market closed on Oct. 25, and with Chinese leaders ramping up the official rhetoric on the reform-oriented nature of the party meeting, investors have snapped up stocks in energy, railway, agriculture and financial services companies, which are expected to benefit from reforms. BEIJING (Reuters) – In defying four years of official cooling efforts, China’s soaring house prices reveal an uncomfortable truth: government is one of the biggest obstacles to the success of taming the market. State income is so entwined in the need for rising land prices that policy efforts to try to curb the house market create an inherent conflict of interest. With one hand on a patchwork of controls aimed at taming record house prices, governments with their other hand are at the same time selling land to developers at rising prices. Speaking together at an event in Shanghai on Wednesday, Alibaba Group Holding Ltd. Chairman Jack Ma, 49, and Tencent Holdings Ltd.Chief Executive Pony Ma, 42, both agreed that growing older in the fast-changing tech sector is a challenge. “My biggest crisis is that I don’t understand what young people like,” Pony Ma said, speaking to an auditorium of students from Shanghai’s Fudan University, where the two announced the new venture—called Zhong An Online Property Insurance and jointly invested in by Tencent, Alibaba, and Ping An Insurance—which will sell insurance products online. Get new posts sent to you by internet elves.